I was trading grain in 1980 when President Carter put on the Russian grain embargo. It was a shock! It felt like one hard punch to the gut. Grain prices, which were already cheap, plunged lower for three days. Futures rallied back and then set back to the lows in late March. A major drought developed in the summer of 1980 and grain prices rallied back. The farmers who avoided making panic sales and held off on grain sales for six months were able to hold it together financially. The trade rhetoric between U.S. and China started heating up in April when soybeans were over $10 per bushel. The actual trade war with China started in early July of 2018. The trade war has been a slow steady bleed. After large draw down in equity, and now six months after the war started, prices have continued to drop and prices and profits are gone. The perfect storm of large crops, the trade war, and the strong U.S. dollar are taking a toll on farmers. The customers we work with who had the right RP crop insurance and 40% to 60% sold ahead are able to turn an operating profit in 2018. I have traded the grain markets for over forty years. I know firsthand how it usually looks the most bearish at the bottom. I have also learned to watch for certain key time periods to identify a “change of trend.” We are in one of the key time periods for a change of trend in early November. The other key time period I am looking at is late February to early March of 2019. 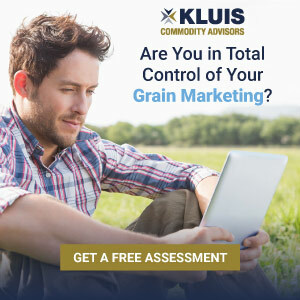 I am going to buy as much time as I can for my customers before we give up any ownership of the remaining grain inventory. 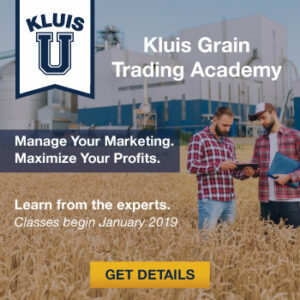 If my long term charts are correct, the grain market and the entire agriculture market is likely to look a lot better by the second or third quarter of 2019. For more information contact Al directly via email or by phone at (952) 767-5500.